I found this beautiful wordings on the meaning of candycane and Christmas. And how it all makes sense is totally beautiful. 1. In a small mixing bowl mix the flour, salt and baking powder set aside. 2. In a large bowl cream together butter and slowly add in the powdered sugar and mix well, add in the vanilla and almond flavoring and mix well. 3. Add the milk and give it a good mix, add in the flour and form a dough make sure you do not overmix. 4. Pop this into a refrigerator for 20 mins/ freezer and then divide the dough into two add red food color into one half of the dough. 5. Make sure to add both dough in separate bowls and color one, mix the food color into the dough using your hands or an electric whisk. 6. Freeze the dough for 10 minutes and then work on it. 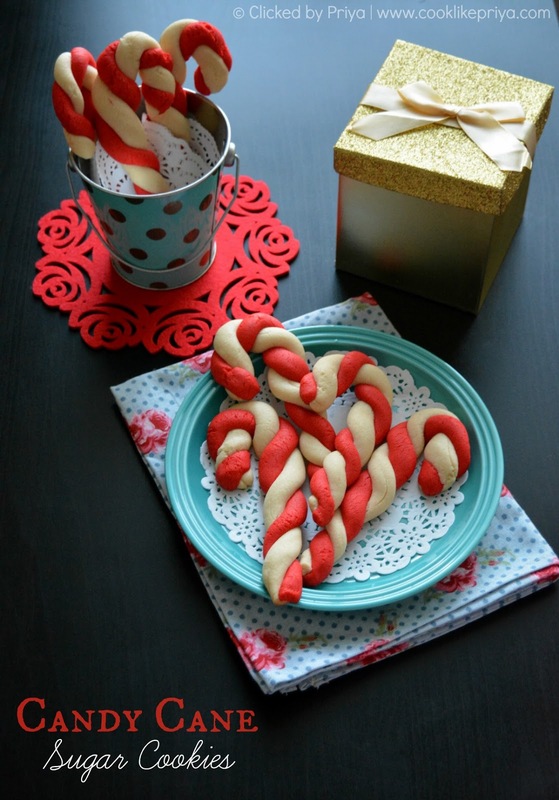 Divide both color dough into equal parts and roll them into a rope of equal sizes and twist them to form a cane shape. 7. Pre-heat oven to 350 F for 10 minutes and line a baking pan with parchment and set aside. 8. Place the cookies in the baking sheet with 1 inch space between cookies and bake in center of oven for 8-10 minutes until u see the sides and edges changing colour. 9. Once done remove the baking tray from the oven and let it cool on a cooling rack for 10 minutes undisturbed. 10. Remove the cookies and enjoy them or gift them as goodies. 1. Make sure to add enough red color once the cookies are baked they look a little lesser red. I used gel red food color. While handling food color take care not to stain your hands or counter top. Use a wooden spoon and always add the dough to a bowl before coloring. 2. Always use a good quality butter as the cookies get their flavor and richness from them. Make sure to add your favorite flavoring like almond/ peppermint. 3. Freezing the dough helps in handing them better. Cannt take eyes priya. God s there m he has all the plans for us . 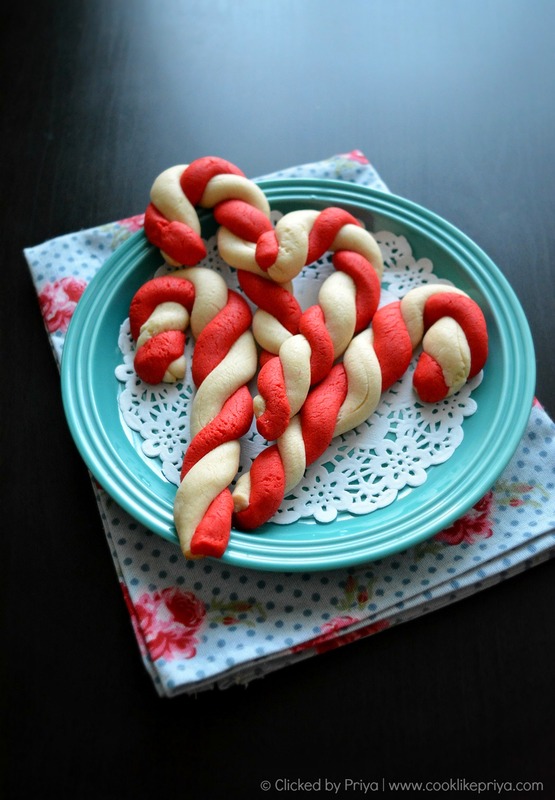 i cant stop gawking at these cookies the colors are lovely and such a cheerful recipe too! You're right... 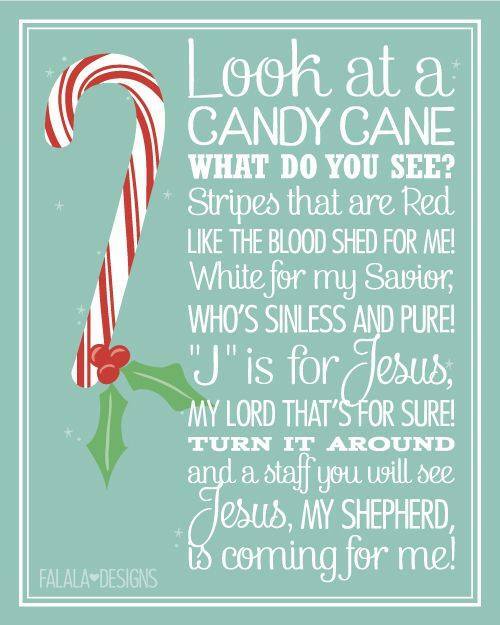 I really like that explanation about the relation between candycane and Christmas. 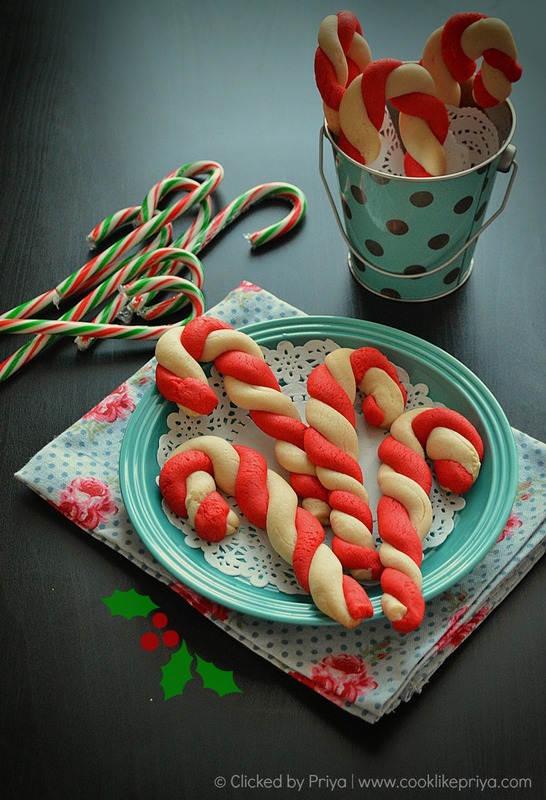 beautiful made candy cane cookies.. 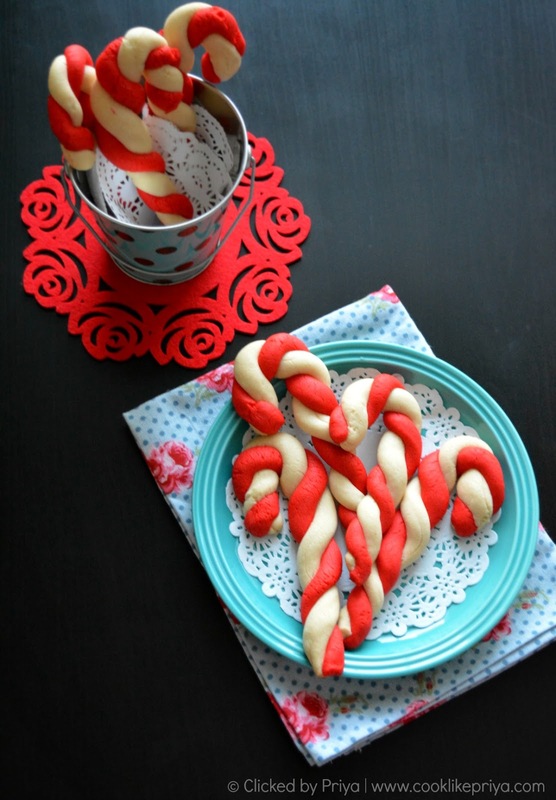 Beautifully made candy cane cookies. Colorful and gives more Chrismassy feeling.